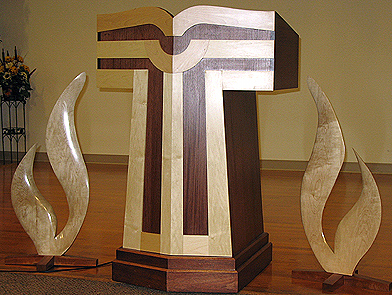 Grouping of the pulpit, flames and table as used in the church, all designed and made by The Design Factory. plywood with the select white maple symbol applied. 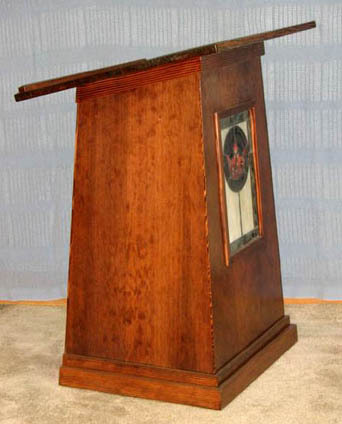 The lecterns surface is 42" high. The flames are made from select white maple mounted on genuine mahogany bases. They were cut out and sculpted. 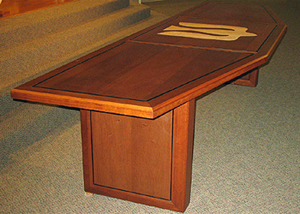 The communion table is made from solid genuine mahogany, mahogany veneer and select white maple. It is 30" high X 36" wide X 144" long. One of two pulpits made for a local church with a second facility in Wallace, Idaho. This one is made from VG Fir with a client supplied stained glass piece. 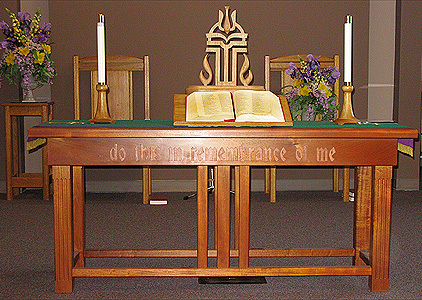 The second pulpit is the same design but made from select white maple. 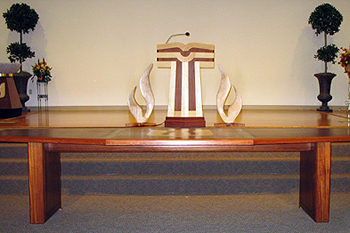 The top is 24" X 42"
The Design Factory designed this pulpit to meet the client's desire for simplicity. 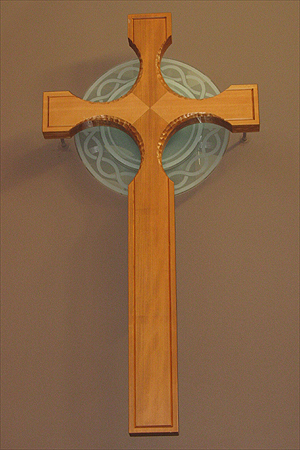 The cross is made from vertical grain clear, dry Douglas Fir. It was glued from 3/4' thick material, shaped, hand carved and finished with Daly's Profin. installed the rope lights on the back and helped the building contractor install it.